We can’t buy it. We have to put in time and effort. It requires delayed gratification. That is, results are not instantaneous. These factors lead to issues in today’s society, as most things we desire can be obtained with the touch of a button, or the swipe of a card. If you can develop the discipline to make appropriate physical training part of your schedule however, I am confident you will be very happy with the return. Even more so than the new driver, putter, or practice aid. I like to compare having a well functioning body to a painters blank canvas. By ensuring you have adequate coordination / motor control, mobility, stability, strength, and speed, you have the basic tools necessary for high performance golf swings. Of course you will still need to develop a functional technique and specific skill level that matches your goals. On the flip side, if you are deficient in these areas, you are like a dirty canvas, your options are limited and you will need to make compensations to achieve anything close to the desired outcome. In simpler terms, movements that are universally desirable in the golf swing may be very difficult, or impossible for you based on your current physical state. It’s important to note these as tendencies rather than flaws, as great ball strikers have demonstrated some of them, but when done excessively they make high functioning swings more difficult, and may make potential injury more likely. Rather than going through all 16 screening exercises which would be a very long read, I have selected 5 that I feel provide a lot of useful information, and can often broadly differentiate the playing level of golfers. There is a lot of debate in golf instruction about what is the correct way to assume posture for the golf swing. Some prefer more rounded shoulders akin to what was common in years gone by, Jack and Arnie being good examples, while others prefer a more extended thoracic spine (less curved upper back), Rory and Adam Scott would be good examples. I’m not a golf instructor and clearly both types can hit great golf shots. I am more concerned with the lumbar spine (lower back) which doesn’t seem to get as much attention when the set-up is being talked about. Note the difference between the spinal curvatures of Jack and Rory. I’m OK with either, as long as the lower back is in a biomechanically sound position (explained in video). An overly extended or arched lower back, which I demonstrate in the video when there is too large a space between the alignment rod and my lower back is a common issue I see. This can lead to a lack of pelvis rotation, lack of power due to the inability to effectively use the glutes and abdominal muscles, and lower back discomfort. Cueing a slight posterior tilt (tucking the tailbone underneath you) often makes a noticeable difference in pelvis mobility, power, and comfort. Pelvic rotation is essential for X-factor stretch, the ability to increase the amount of separation between the pelvis and torso during transition (moving from the backswing into the downswing). This is often referred to as starting the downswing with the lower body/hips (while the torso is still rotating away from the target or is paused at the end of the backswing). It is critical for effective sequencing and power production. Increasing the separation between your pelvis and torso on the downswing increase what is known as the “stretch-shortening cycle” of your trunk and torso muscles, which is like adding more stretch to an elastic band, then releasing it. If you cannot separate pelvic rotation and torso rotation, it will be extremely difficult to be a good golfer. Here is a great visual, watch how Rickies pelvis rotates towards the target independent of his torso. This increases the elastic energy stored in his muscles and tendons, allowing for big power production. 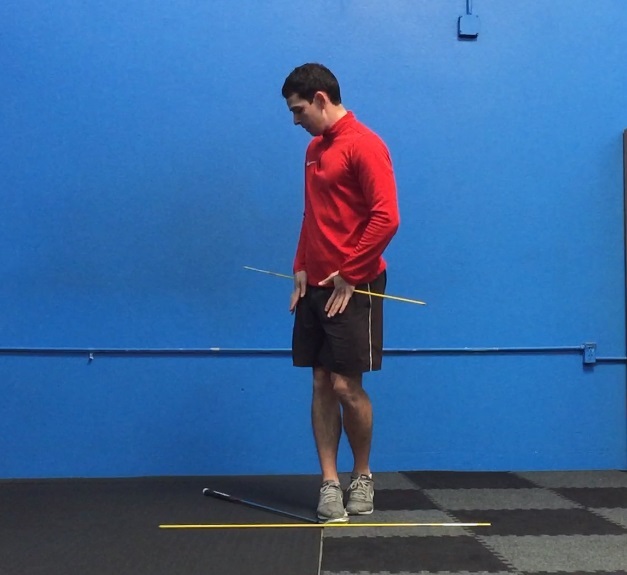 The Lower Quarter Rotation Test shares some similarities to the Pelvic Rotation Test but one key difference is that it doesn’t require nearly as much motor control. Many people fail the pelvic rotation test not because of a mobility limitation, but because they can’t control the different segments of the their body, and perform the action they want to (motor control issue). The Lower Quarter Rotation Test on the other hand does not require anywhere near as much control and therefore looks more directly at the internal and external rotation mobility of the lower body. People who struggle with this test are more likely to sway, slide, and have reverse spine angle. I’m confident DJ would do OK on the Lower Quarter Rotation test. Look at how well he can turn into his right hip. This one usually resonates with golfers as “getting a full shoulder turn” is something that golf media and players like to talk to about regularly. I think most people understand the concept of a sufficient shoulder turn being important for creating power. Restricted thoracic spine rotation can stem from a few different causes. A common one is excessive thoracic flexion (rounder upper back). To test this for yourself, try the test in the video hunched over, and then with your spine as long as possible. You should notice you can rotate further when you sit extended. Many popular golf instruction pages on social media post about the importance of shallowing the shaft in transition, and trail arm external shoulder rotation. I understand the reasoning for this in terms of swing technique, but something that needs to taken into consideration is whether the golfer actually has the ability to externally rotate their shoulder. This is often not the case. Two interesting trends I have noticed with golfers and external shoulder rotation. A larger % of US golfers compared to Irish golfers (the two countries I have worked in) tend to have much more trail arm external rotation available. This is mainly due to throwing baseballs & footballs in their youth, which doesn’t happen in Ireland. Shoulder external rotation, shoulder flexion, and thoracic extension, really seem to reduce as golfers get older, compared to other movements. Please take note of this and put some exercises into your routine that promote mobility & stability in the thoracic spine and scapula, as these are the foundation for sound shoulder mechanics. Thoracic extensions on a foam roller, relaxed hanging from a pull up bar, and wall slides with external rotation are some exercises I like to use. I think this guy has enough external shoulder rotation. You can also get a TPI Movement Screen, Body-Swing Connection Analysis, and 4 week individualised program by going HERE. Rory- golf.com, Jack – golfdigest.com, baseball guy – Lehmans Baseball.